My invitation, quizzing by DSS not strange — Oshiomhole. 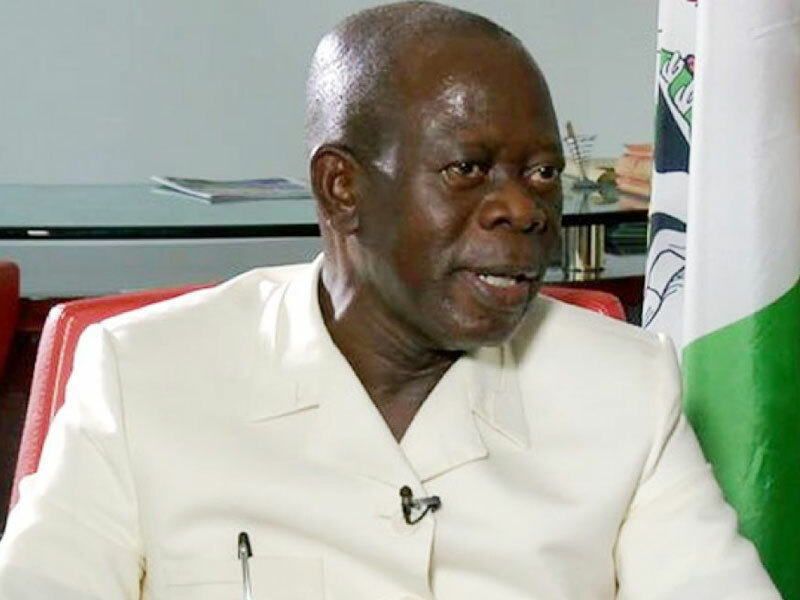 The National Chairman of the All Progressives Congress, Comrade Adams Oshiomhole, has described his reported detention and grilling by the operatives of the Department of State Services last week as normal. Specifically, Oshiomhole said it was not the first time he would be a guest of the DSS, starting with his days as a labour activist. The embattled APC chairman arrived in Lagos on Friday from his short journey to the United States of America, where he was said to have visited his wife, Iara. Speaking in Lagos on Saturday, however, the former Edo State governor denied being arrested and detained by the DSS, hardly agreeing that he was invited by the agency. I went there on my own; I was not arrested. I saw the DSS only once and it was a conversation, not an arrest or detention,” the ruling party chairman added. He said, “If you say I was interrogated by the DSS, you would be implying something totally different. There is nothing strange in the DSS having a chat with me. Let me tell you, from my days as a labour leader, when I’ve been visiting the ‘E-Department, which later became the Nigeria Security Organisation, which is now known as the DSS, there is nothing new about it. Oshiomhole denied being let off on administrative bail, adding that Kogi State governor, Yahaya Bello, did not come to the DSS office to facilitate his freedom. “I was the one who called Yahaya Bello and he came but I drove home in my own car,” he added. Oshiomhole dismissed the reported allegations of corruption or inducement by some party members. He said, “Let me tell you, I’ve heard some people talk about bribe and Imo State. I’ve looked round and I’m asking myself, who, in Imo State can afford to bribe me? On Imo State, Oshiomhole said there was no way the dynastic enclave being proposed by Governor Rochas Okorocha would be allowed to stand. “Let’s even agree that Okorocha ends up having his way even in a managed ‘process’, how do you think Nigerians would view such a situation where his sister, his in-laws and in-law to be would all be in government,” he said. He explained that Okorocha, as a friend, attended his inauguration in personal capacity, saying this underscored the closeness between himself and the Imo State governor. Oshiomhole berated the Peoples Democratic Party for calling on INTERPOL to arrest him and for insinuating that he had fled the country after being granted bail by the DSS. What would they have said if it was the PDP chairman that was invited by the DSS, for instance, over the dollar bazaar at their Port Harcourt primary? “They would have said democracy is under threat and would have fired a letter to the UN as they often ridicule themselves,” he stated. The national chairman took time to explain the situation in Imo, Ogun and Zamfara states which have generated so much heat in the party but expressed confidence that overall, the APC was at peace with itself because there was stability in the system. Some people are unhappy because they didn’t have their way in three states. We have said that things must change. We cannot continue in the old ways. We said change; maybe, some people interpreted it differently. But as I said, we cannot continue in the old ways,” said the party chairman. SUNDAY PUNCH learnt that the embattled ex-governor had told the DSS during his session with the operatives that he knew that the agency did not take directive from President Muhammadu Buhari to quiz him as the operatives had insinuated. It was learnt that Oshiomhole told his interrogators that he maintained “a one-on-one relationship” with the President. He was said to have told the operatives to allow his driver to leave their premises if they knew he was going to be detained in the facility. Okorocha and the governor of Ogun State, Ibikunle Amosun, have been at loggerhead with Oshiomhole over the outcome of the APC primaries. They had blamed the ex-Edo governor for their inability to get the governorship tickets of the party in their states for their anointed candidates. But Amosun had denied having a hand in Oshiomhole’s invitation by the DSS.